Disclaimer: This product was received complementary from W2Beauty.com, all opinions and thoughts are my own. I totally love Benton products ~ Their Snail Bee Essence and Snail Bee sheet masks are products I am never without. I am currently using their Aloe line this summer and then Benton HAD to come out with a new line ~ Fermentation! Oh yeah, the offspring of my love of fermented ingredients and Benton has come to fruition. I was given the opportunity to try both Fermented Benton products from W2Beauty to review. I love how the new items do not interfere with their other products, so you can use Snail Bee, Aloe and now Fermentation. I will be reviewing the eye cream in the next few weeks, but this review is about the Fermentation Essence. There are two types of essences ~ the first type is a traditional essence ~ it is thicker than water and is used somewhere between the toner and moisturizer steps. Think of Benton Snail Bee High Content Essence and they are very similar to serums. In fact, I use those types of essences interchangeably with serums. 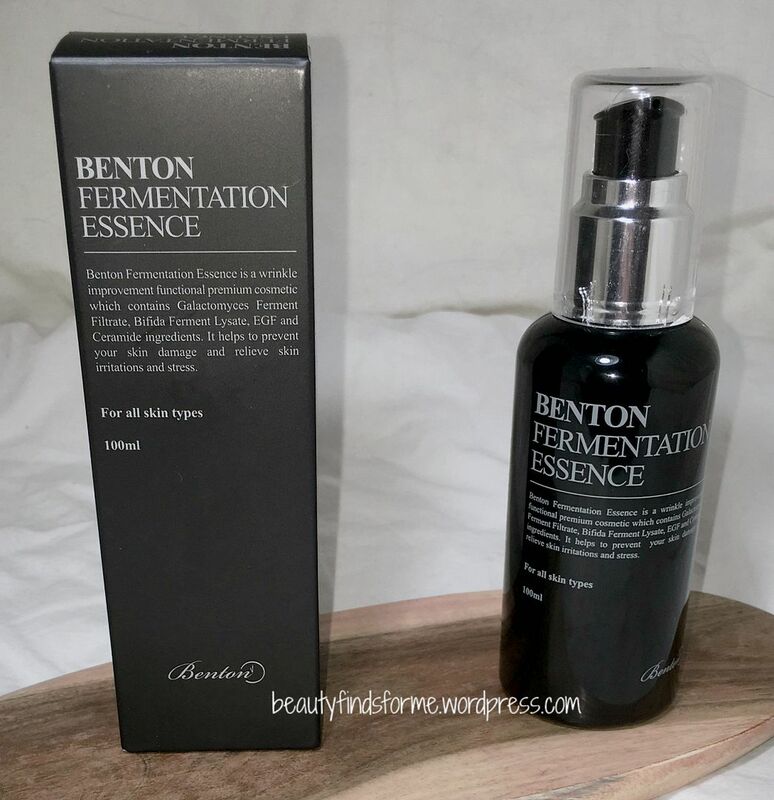 Benton Fermentation Essence is not that type of essence, but what is considered to be a First Essence, Treatment Essence and/or Treatment Toners ~ these are very watery concentrated formulas, very nutrient-enriched and it preps your skin, while providing benefits that will help reduce/prevent fine lines and wrinkles, dull and uneven skin tones. These are boosters and provide an instant shot of hydration and nutrients to your skin and prep your skin to accept your other skincare products. Some of the more famous (but I have never used) first essences are SK-II Facial Treatment Essence and Missha impossible long name Time Revolution The First Treatment Essence. I personally have used Goodal Waterest Tone Up First Essence and I love it, but that formula is discontinued, so I am on the hunt for another First Essence. This is full of nourishing anti-aging ingredients ~ I love it! Bifida Ferment Lysate is being used in skincare more often and the claims are that it works as a DNA repair agent when applied to your skin, although there is no study to prove those specific claims ~ however there is a study about it helping with skin sensitivity (study). Bifida lysate is the fermented result of bifida and it should help revitalize skin so it is clear and radiant, increase hydration and prevent dehydrated, rough skin. It should also firm and restore elasticity to your skin while strengthening your skin barrier to help prevent damage from environmental factors. Adenosine is yeast derived providing anti-wrinkle and anti-inflammatory benefits. rh-Oligopeptide-1 AKA Epidermal Growth Factor(EGF) will help stimulate cell renewal to produce collagen, helping nourish and slow down the aging of your skin. It also speeds up wound healing, which makes it an excellent ingredient if you suffer from blemishes. Ceramides are an oily wax that is found naturally in your skin will help retain water and moisture in your skin, as well restoring and repairing your skin’s barrier and help with cell regulation. As we age, we create less ceramides, which will result in wrinkles and dry skin, which is why many anti-aging skin care products include ceramides in their ingredients. Aloe Vera is a powerful moisturizer that doesn’t leave your skin feeling oily or greasy. It soothes, treats inflammation, helps speed up skin healing and also has a plethora of antioxidants ~ beta-carotene, Vitamin C and Vitamin E, which help improve your skin’s firmness and keeps your skin moist and hydrated. It also contains over 75 different nutritious ingredients, including minerals, enzymes, amino acids, salicylic acid and much more. Betaine is an amino acid that acts as an humectant and control the water/oil balance in the skin while moisturizing and strengthening your skin barrier. It will help tone and firm your skin so it has more elasticity and can smooth out wrinkles and fine lines. As an anti-inflammatory, it will help reduce irritation and does not have any stickiness when applied to the skin. This highly concentrated fermented goodness is in a 100 mL bottle with a pump applicator. My initial confusion over this item was because of the pump, and thought it was a traditional essence, but once I pumped out the product, I knew this was a First Essence. The main ingredients are yeasty ferments, so it will help restore the balance in your skin as well deeply hydrating without an oily residue. 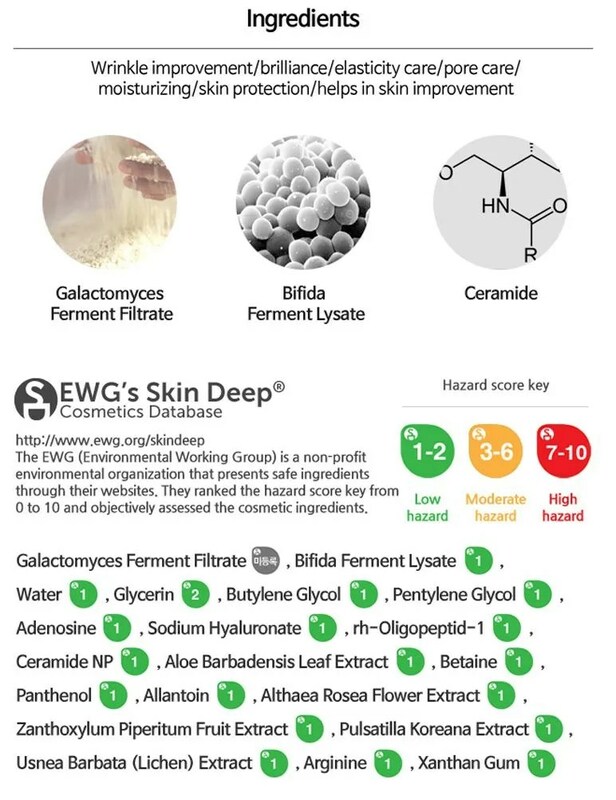 I was concerned a bit with ceramides in the ingredient list, as products that usually contain that leave a film on my face. However, this watery essence does not leave any sticky or tacky residue, nor does it leave a film on my face. It is colorless and has no scent either ~ I love that Benton didn’t add perfumes to this product, as so many brands love adding heavy florals or baby-powder scents. This essence just soaks into my skin, rapid absorption and it is like it was never there ~ like a fantastic house guest!! 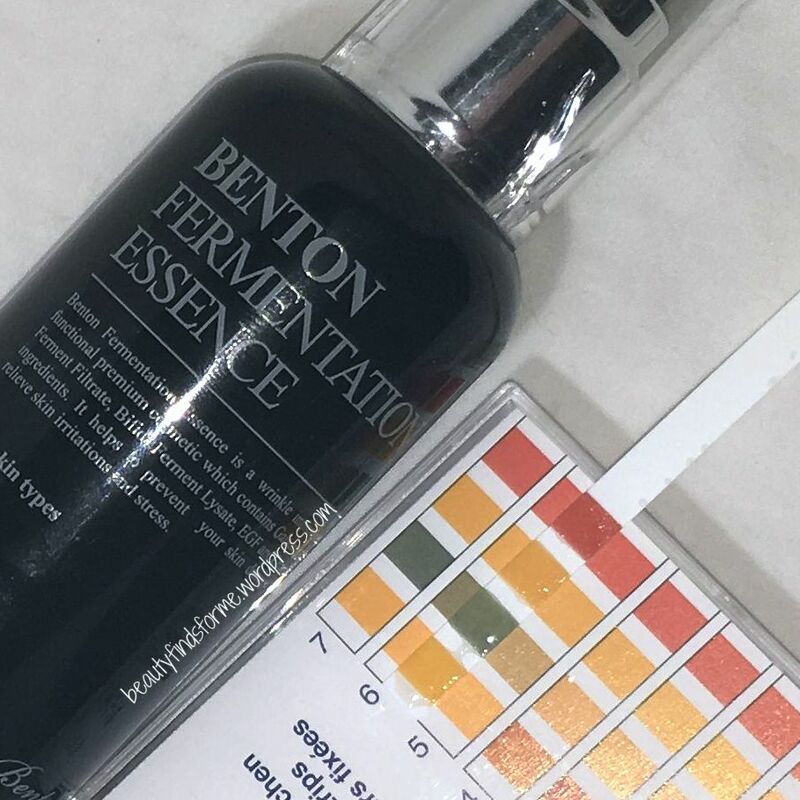 Benton claims that Fermentation Essence will moisturize, brighten, soften and tone your skin while helping to reduce the appearance of fine lines and wrinkles. So, based on Benton’s suggestion, you are to use this product as the first step after cleansing. Since I am a rebel and have tons of toners, I use it after my normal toner step. I do not use a cotton pad, but I place the product in the palm of my hand and apply to my face that way. I feel that the cotton pad uses more of the product than my skin! I have also read that people like to put First Essences in a mist bottle and that would work as well. As I stated earlier, this is very fast absorbing and hydrating, without a sticky or filmy residue. I find that I just slather this on my face and neck, because it feels so refreshing on my skin. How moisturizing is this essence? Well, on average, I have found it temporarily increased my oil/moisture levels by eighty percent. Applying this product on your face is like dunking your face in water ~ but it is so fast absorbing that I was a bit surprised that it registered that high. Since Benton claims that the pH level of this essence is 6, I wanted to test it out myself. I found that it was closer to 6.5 ~ the olive green square was not quite a 7, but it wasn’t a solid 6 either. This is acceptable for me, as there are no claims by Benton that this is a pH balance essence. It is still slightly acidic at 6.5 and for many people this is a good level to use. I really love this first essence. It is very different from my favorite discontinued Goodal Waterest essence, but the simplicity of the ingredients combined with its amazing hydrating properties, make this a winner. It made my skin feel softer, smoother and it helped with the overall skin tone clarity for me. I felt that when I used this, my skin looked more vibrant and brighter. It doesn’t cause any blemishes for me, nor does it contribute to my oil production. 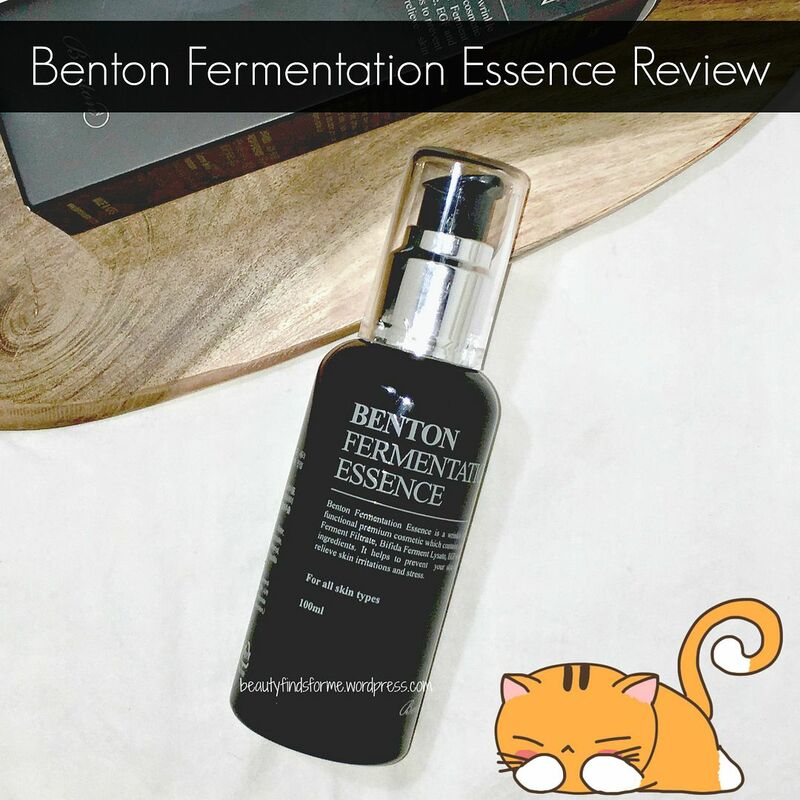 I have oily skin, so I layer a lot of products and Benton Fermentation Essence fits in my skin care routine easily, as it is fast absorbing, not requiring a lot of time between steps. 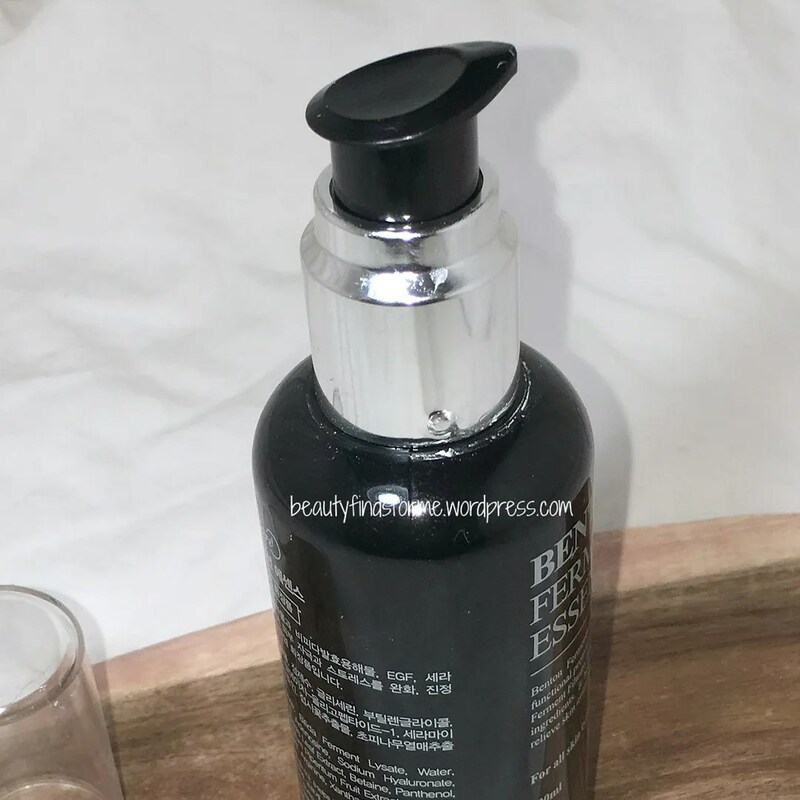 I shouldn’t be surprised that I love this item ~ Benton usually gets 100% top marks for me~ the exception is their foaming cleanser ~ and Fermentation Essence does deliver for me. I have already purchased another bottle, that is how much confidence I have in this product. Have you tried Benton’s Fermentation series yet? Which item have you tried ~ the essence or eye cream? Or will you purchase this item? Let me know in the comments below ~ I am always interested in my reader’s thoughts! If you never ordered from W2Beauty before, use my referral link (click here) or use my sponsor code 0811226902 and get a $5.00 coupon for your first purchase! Look for my review on the eye cream in a few weeks! Unboxing July 2016 Yogi Surprise Jewelry Box + Promo Code & August Spoilers! How would you say it compares to the Purebess first essence? I am using the bottle I won on your giveaway, and this is literally the FIRST first essence that has made a visible difference for me (I’ll write a review, it was such a nice surprise. :)) So, it’s already on my list of products I’ll need to purchase, but now I kinda wanna try the Benton one, too. I am so happy you like the Purebess ~ it was my first product with Galactomyces and I had no idea it was a first essence at that time! I am looking forward to reading your review on it. I actually like both ~ Purebess is “pure” so if someone is sensitive to other ingredients in Benton or want to keep it simple, it is perfect. However, Benton has more beneficial ingredients, glycerin, peptides, sodium hyaluronate and ceramide, so if you are looking to step up your game, I would say this product is pretty good! It is unscented too, so that is a plus as well. how is the melano working for you? Did you also try the face shop eye patches? I swear nothing had ever made the remains of a zit (I really just messed up a blackhead and succeeded in making it much worse than it would have been on its own) disappear as quickly as the Purebess essence. And I know that’s what it was because I was using my Sulwhasoo first essence my dad’s wife had brought for me from their trip to Malaysia, and I checked the expiration date on the Purebess, and since it was like early 2017, I decided to switch to make sure I don’t run out of time, and within two days, there was nothing left of my zit art (and my skin is awful, AWFUL with recovering from the leftover discoloration.) I have no idea why, but that thing is absolutely awesome for me. It’s too bad that the Melano doesn’t work for you with hyperpigmentation like it does for me, BUT it is amazing at keeping zits at bay. I know when I don’t use it, my pimples come back like that bad houseguest, but once I use it, it just clears it up nicely and they stay away. I totally understand about the reoccurring pimple – I have a hotspot on my chin (why can’t it be on the side of my face where my hair will hide it??!!!) and using melano has really helped. if you love those TFS eye patches – Jolse carries them too. I just purchased about 10 packs of them (2 in each pack) they are instant eye lifts for me! Yeah, I think we bought it at the same time. 🙂 I was just curious how you liked it because it feels a little sticky to me. ahhh, it is probably similar to Innisfree’s Green Tea Cleansing Water – that is sticky and I only use it in the wintertime. Maybe I will wait for cooler weather. How does it smell to you? What bout the way to store it? Because since the benton snail essence is very easy to get contamined by color changing, so what about this one? I’d like to try this because im so in love with the less chemicals of benton’s ingridients. I never had any issues with any of the Benton products, including the snail bee. No color changes, nothing. They had an issue several years ago with a bad batch, but nothing since then. Benton has changed their preservative to make their products more stable, but they do recommend that you use it within 18 months after purchase and 6 months after you open it. So how does this compare with the Snail Bee Essence? How are they different? Is one better than the other? hi patrica! The fermentation essence is a “first essence”, which means it goes on before your toners and helps boost skincare products effectiveness. This has fermented ingredients, which are great for many skin types, as it helps with moisture/oil balance and for me, helps with my acne. It is very watery. The Snail Bee essence is a traditional essence, it goes on after your toners and other watery products and before lotion/cream. It has bee venom and snail slime, so it is geared more for blemish prone skin and healing. I love that essence and I have plans to review that by itself in the future. These two products can work together and I have used them in the same skincare routine. 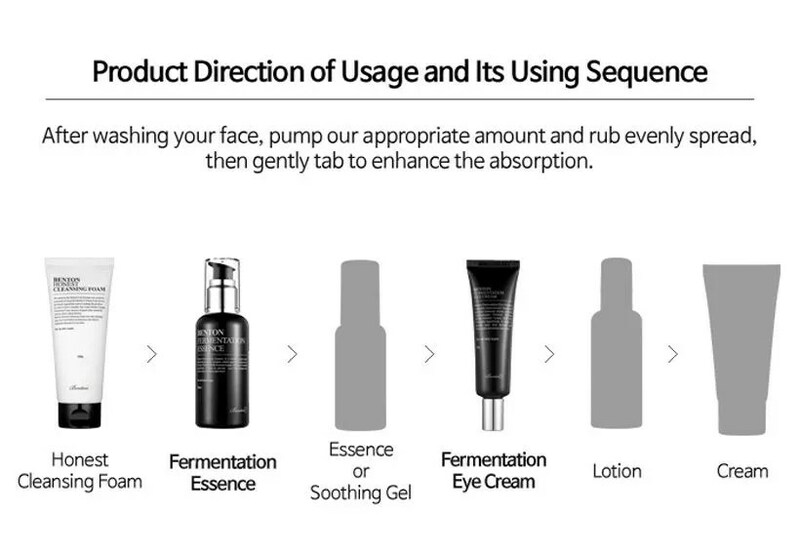 It would go Fermentation Essence -> your toner -> snail bee essence -> lotion/cream . If you have serums/ampoules, depending on their texture (watery, gel-like) they would either go after the toner or after the snail bee essence. The rule of thumb on applying skincare is start with the most watery texture first and then apply from watery to gel to cream texture. I hope this helped!